Former amateur star David Haye picked up a significant scalp on Wednesday when he stopped former IBF world cruiserweight champion Arthur Williams. 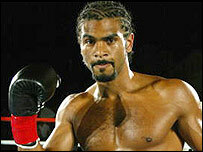 Haye dominated from the start and the fight was stopped late in the third. The 39-year-old American came into the non-title bout with a big reputation but had no answer for Hayes' quality. "A lot of people thought this was a step too far but I trained like a beast and there was no way I was going to come unstuck," said Haye. "I'd done 60 rounds with quality sparring partners and just wanted to prove to everyone that us British fighters can compete with the Americans," the 2001 World Amateur silver-medallist added. "I want to be a British world champion the way Lennox Lewis did it, against the top fighters from all over the world. "I'll fight anyone as long as they are ranked above me and it's going to push me to number one in the world."